Borgo Pio Apartment with Balcony. Very nice and renovated apartment with balcony located just few steps from St. Peter's Square. 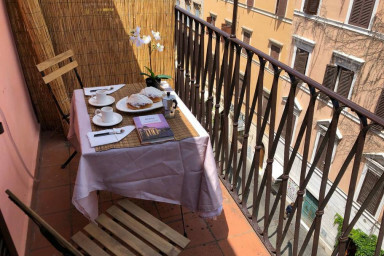 This nice and renovated apartment with balcony is located just few steps from Piazza San Pietro, in the characteristic Borgo Pio, one of the oldest neighborhoods in Rome, in front of the main entrance to the Vatican City. It is comfortable and welcoming and, while not lacking any comfort, from the elevator to the equipped kitchen, living room with balcony up to the comfortable bathroom with tub / shower, it will appeal especially to those who love the romantic soul of Rome. It is an apartment with an interesting style and bohemian allure, while having every comfort. .
Naprosto dokonalé místo a krásné a čisté ubytování. Prostě naprostá spokojenost. Abbiamo soggiornato nell'appartamento a Borgo Pio, una struttura bellissima sita a due passi da San Pietro in una zona pedonale dalla quale è comodissimo visitare la città. L'appartamento, restaurato da poco, è molto pulito, accogliente e dotato di tutti i confort. Francesca, la ragazza che ci accolti, è stata disponibile e gentile. Se dovessimo ritornare a Roma sicuramente riprenoteremo qui!!! !